Fiber. It's not the most pleasant topic in the world, but it's one that is often necessary, particularly for women. We all have suffered from diarrhea or constipation at one time or another. Doctors usually recommend a psyllium fiber supplement. Konsyl Original is the #1 doctor-recommended brand of fiber supplement. Fiber can also help lower cholesterol, my main goal. Fiber can help maintain or lower cholesterol thereby reducing your risk of heart disease. Fiber actually has numerous health benefits. So while Mary Poppins might have suggested a spoonful of sugar, I'm suggesting a spoonful of psyllium fiber. Konsyl comes in a variety of supplement types from powders to capsules. They also make gluten free and sugar free supplements. 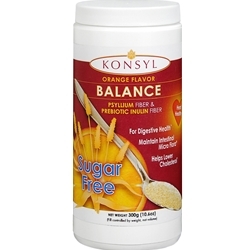 I tried the Konsyl Orange Sugar Free. It provides 6 grams of psyllium fiber per teaspoon does, which is more than other brands. It's a smooth, easy to mix powder, and the orange flavor makes it easier for me to drink. I also tried the Konsyl capsules, which are the easiest way to add fiber to your diet. The capsules are both sugar free and gluten free. If you can benefit from adding some fiber to your diet, this is the giveaway for you. One winner will be able to select one Konsyl product to try. All you need to do to enter is leave a comment on this post. If you choose a powder product, you will also receive a shaker cup. If you would like a second entry, tweet this giveaway and leave a second comment with your tweet link. It's that simple! Giveaway is open until 10:00 PM CST on November 11. (US and Canadian residents, please) Winner will be notified immediately and will be required to respond within 24 hours. This post was written on behalf of Family Review Network and Konsyl who provided the product for review and giveaway. All opinions are 100% mine.